Solid ramps are one-piece solid aluminum ramps. They are strong and lightweight, but they do not store as compactly as single fold or multi-fold ramp. 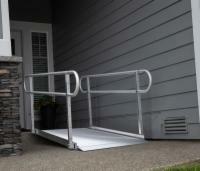 We recommend solid ramps for use in clearing small height obstructions around the home. A single solid ramp can be even be moved from location to location as needed, but these ramps are generally for stationary use. These ramps will also store easily in the bed of a truck or rear storage area of a van or SUV. Just like with all of our other products, our wheelchair ramp prices are under our low price guarantee. We also offer free shipping on all of our ramps, which can save you a ton of money!